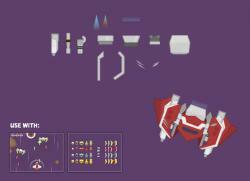 An expansion pack to my previous Space Shooter art package and extra elements. Add weapons, engines and other elements like scratches to your spaceship for that extra bit of realism. Thank you very much for these ships, Kenny, I'm using them in a game prototype right now. And while I love your new weapons in this set, I'm missing the missiles/bullets they are supposed to shoot! CHECK IT OUT!! THX KANNY! !